The home of progressive skincare products and the addictive sounds of K-Pop, Korea is leading the way when it comes to the latest hair trends. While the runways at the S/S19 Hera Seoul Fashion Week were hot with edgy designs, it was the city’s influencers and their bold street style that caught our attention. 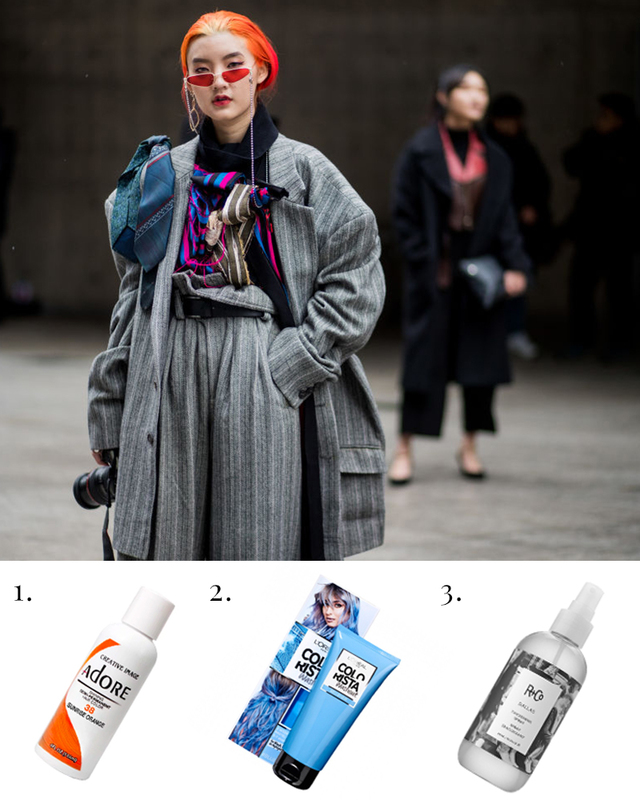 Between the BESFXXK, Heta and EENK shows, Korea’s style setters were rocking individualistic twists on the city’s iconic street style paired with statement, in-your-face, no denying it came from a box, hair colour. 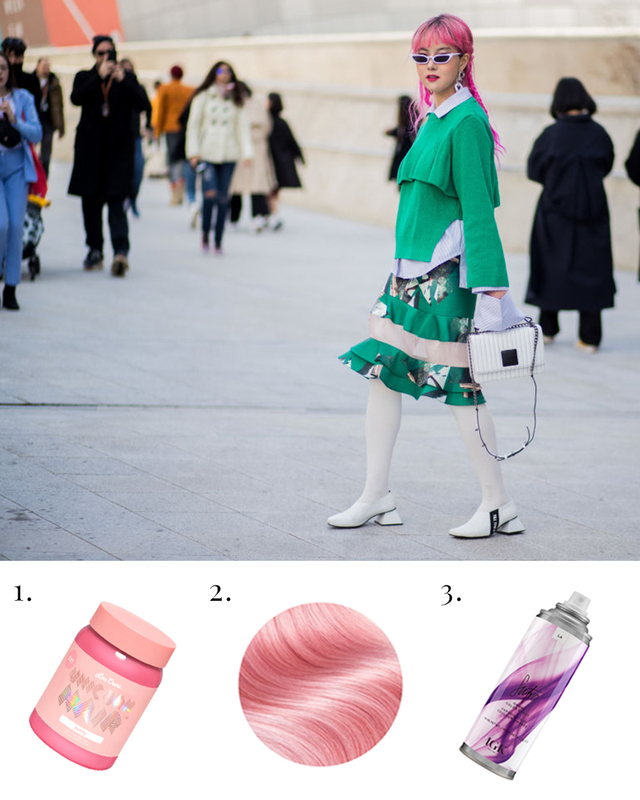 While it's not the first time we’ve seen the bright hair trend, Seoul Fashion Week has really dialled up the saturation. There’s no doubt that this summer is all about statement Skittle-coloured hair. From neon brights to worn-in fades, we’ve found the products to take your hair from balayage to in-your-face-bold. If you want to add some candy-coloured fun to your style, try a foolproof DIY colour with Lime Crime’s (1) vegan and cruelty-free semi-permanent Unicorn hair tint. Go full Seoul street-style and rock your pastel locks plaited into sweet braids; pop in a couple of ready-braided pastel human hair extensions from Glam Seamless (2) for the easiest way to incorporate texture in your watercolour locks. If you want to dip your toes into the pastel pond before committing to a semi-permanent colour, try IGK’s Sutro Ombre Color (3). Spray for buildable lilac hues that wash out in the shower. Get that lived-in electric fade by liberally applying AMR’s ammonia and peroxide-free Adore Semi-Permanent hair colour (1) in Sunrise with a brush and then comb through your ends. A trip to the salon beforehand to bleach the roots will give a more vibrant contrast when you colour, and a brighter fade down the track. For an instant fade, lightly apply some Vaseline or a thick conditioner to the roots before the colour, or use L’Oreal Paris’ Colourista Washout (2) followed by a couple of shampoos. Add movement and volume to your style by spritzing R+Co’s Dallas Thickening Spray (3) generously all over before blow drying. For additional texture, run a curling wand through sporadic sections of your hair, before adding a dab of Drybar’s Whiskey Fix Styling Paste to your hands and using your fingertips to work through your waves. To truly live your best neon life, you need to start with a properly prepped base; we recommend going to a professional stylist to have your hair lightened (and properly treated) ready for intense colour. If you’re blonde or have lightened your hair already, clean up your base colour with Fudge Professional’s Paint Box Whiter Shade of Pale (1), which neutralises any brassy tones for a crisp result once you apply your colour. For unmistakeably 'out there' hair, Arctic Fox’s Semi-Permanent Hair Colour in Neon Moon (2) with a touch of Phantom Green (3) will do the trick, plus it’s vegan and cruelty-free. Keep your colour looking fresh by using the Rita Hazan True Color Ultimate Shine Gloss in Clear between shampooing and conditioning in the shower. With such heavy duty colour action going on, treat yourself to a hair oil like the Abhati Suisse Chambal Sacred Hair Oil to prevent dryness, breakages and split ends. For epic fluro colours without the commitment, you can’t go past Manic Panic’s vegan Amplified Colour Sprays, which are also cruelty-free with no nasties in sight. Get the true highlighter yellow by mixing the Electric Banana and Electric Lizard; it’ll wash out in the shower, but we’re certain it’ll be fun while it lasts. Want more trends? What about pumpkin spice scented beauty?